Mining News - Steel Consumption in ASEAN Countries - 2017? Steel Consumption in ASEAN Countries - 2017? Mining News Pro - ASEAN’s (Association of Southeast Asian) six countries observed contraction in its steel consumption in the year 2017 amid a slowdown in the construction sector as well as due to destocking activities in countries like Thailand, Vietnam and Malaysia. 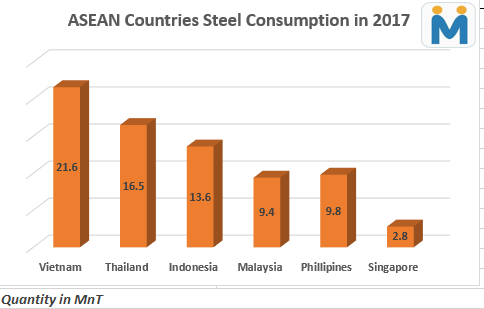 According to the latest data issued by SEAISI (South East Asia Iron and Steel Institute), ASEAN’s six countries (including Indonesia, Malaysia, Thailand, Philippines, Singapore, Thailand and Vietnam) total apparent steel consumption dipped by 4.1% y-o-y basis to 73.8 MnT in 2017. Vietnam: According to SEAISI data, continuing its trend as previous years, Vietnam remained the biggest steel consuming country amongst six ASEAN countries in 2017. However, its steel consumption dropped by 3.1% y-o-y basis to 21.6 MnT during the year. This came after three consecutive years of annual consumption growth rates of more than 20%. In coming years, while Vietnam’s steel demand is expected to return to the growth path, the rates of growth are unlikely to be as robust as before. Thailand: Country’s steel consumption in 2017 also dropped by 14% y-o-y basis to 16.5 MnT against 19.2 MnT in 2016, majorly driven by slowdown in construction activities. Thailand’s steel sector was also badly hit by the destocking activities following a massive stockpiling in 2016. Indonesia: Unlike other countries, Indonesia’s apparent steel consumption continued its turnaround in 2017 as the same increased from 12.7 MnT in 2016 to 13.6 MnT in 2017. Country’s the annual steel consumption in 2017 registered an increase of 7.3% y-o-y basis which was 11.4% in 2016. Malaysia: The country’s steel consumption for the first time registered a fall of 7.9% y-o-y basis since 2013 and is recorded at 9.4 MnT amid fall in its steel demand. The country’s total steel consumption has remained the same at 10 MnT over the past four years starting from 2013 to 2016. Philippines: The steel demand in the country started to pick up rapidly from 2010 and has been growing continuously since then. In 2016, the country’s steel demand jumped 10.5% year-on-year to reach 9.7 MnT. However, in 2017, Philippines’ steel consumption growth slowed down to only 1.5% and total steel demand in that year inched up to slightly above 9.8 MnT. Singapore: The country steel demand trend showed the trend of the mature market as the same dropped marginally by 1.6% y-o-y basis to 2.8 MnT in 2017. While total apparent steel consumption of ASEAN countries dropped, crude steel production picked up strongly in 2017, by 27% year-on-year to 26.3 MnT. Production of hot-rolled steel products also increased from 31.9 MnT in 2016 to 34.7 MnT in 2017, a jump of 9% year-on-year.